In its continuing quest to greatly injure public discourse by gifting legitimacy to arguments from all sides, the Washington Post op-ed page published a hilariously dumb and wrong-headed column Friday by rural Ohio newspaper editor Gary Abernathy, mourning the loss of American professional sports’ apolitical purity. What makes sports so popular in our culture? The answer is simple: It’s a couple of hours of escape from the real world during which people from all walks of life can forget about their troubles and cheer for a competition that, at the end of the day, is relatively meaningless. Abernathy positions his gripe as primarily to do with athletes—NBA athletes in particular—injecting their personal politics into sports as an entertainment product. Not coincidentally, Abernathy’s examples of these intrusive personal politics are confined to “liberal causes;” even less coincidentally, Abernathy is a self-described conservative. But in recent years, under Stern and now Adam Silver, the NBA has fully embraced the politics of the left. There seems to be no cause too liberal for corporate NBA, which emboldens the league’s players to follow suit and entangle their personal politics in league affairs. It is in that light that we digest the comments about President Trump by James and Stephen Curry after Trump’s withdrawal of a White House invitation for the champion Golden State Warriors. In a political environment where Trump is regularly referred to as a racist under the newly expanded definition, athletes who treat Trump contemptuously have built-in media allies leaping to their defense. 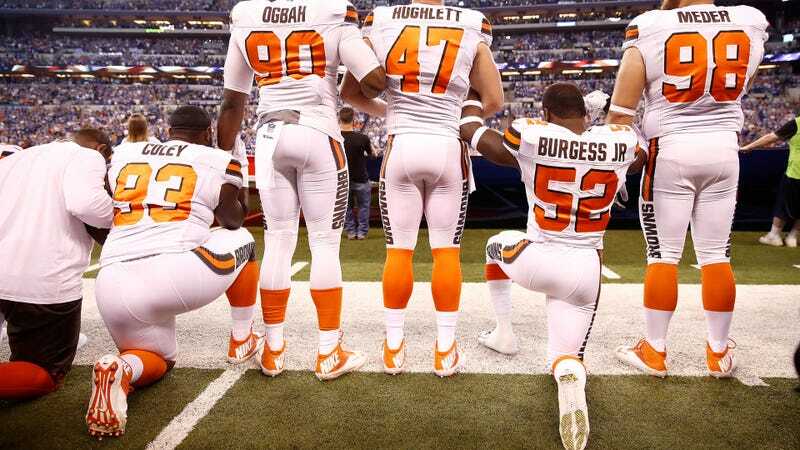 Likewise, Trump’s criticism of the disrespect shown to our veterans and our country by a growing number of NFL players during the national anthem is predictably met with accusations of racism. Leaving aside the “newly expanded definition” comment—one wonders what definition of “racism” Abernathy has been using all this time—what he has now done is grouped off-court, off-season, extracurricular political outspokenness and activism by several prominent NBA players together with NFL anthem protests, under the group heading “the political expressions of black athletes” and relegated all of it to the “ways in which the world is now worse” bin. Pretty good timing by Abernathy to get in that “newly expanded definition” comment before executing this maneuver! Athletes, black or white, have every right to participate in politics and work for causes important to them on their own time. Like, for example, when they use social media during the offseason to comment on the behavior of the President of the United States? Or when they make a choice about how to use their free time during an annual trip to play the Washington Wizards? But when they bring their political statements onto the field of play or refuse an invitation to the White House, it destroys many fans’ connections to sports. Ah ha. So: protesting racial injustice while in uniform and on the actual field is the same thing as expressing political ideas on social media, and also the same thing as declining an invitation to visit the White House. What we have cleared up, now, is where and when, exactly, black athletes may express their progressive political ideas: nowhere, and never. When athletes contaminate sporting events with politics, they extinguish the only thing that makes sports matter: their very irrelevancy. The real world hits us in the face every day. Sports are our escape, and if fans lose that benefit from the leagues they love, the leagues will lose their fans. Beyond being smarmy, self-serving bullcrap, this is also ahistorical: Muhammad Ali became the most popular athlete of all time after he made his personal politics central to his public persona; Colin Kaepernick’s jersey is among the most popular across the NFL; for that matter, actions like standing for the anthem and shaking hands with the President are political acts, if for no other reason than politicians and parties use them for political gains. This is so dumb. American professional sports have never been free of politics, and Americans have mostly never cared, probably because the reason we watch sports has less to do with escaping “the real world” and more to do with the fact that watching someone dunk the hell out of a basketball is pretty fun. The chickenshit hypocrisy of this is almost breathtaking. You will not find a person who is objecting to LeBron’s tweet or the Warriors’ travel plans who does not also disagree with their politics. The concern isn’t that politics will invade professional sports; the concern is that you won’t be able to root for athletes who don’t share your personal political beliefs. Their ideas are offensive to you, and so you won’t be able to stomach watching them perform on television. That’s pretty tough for you, I’ll admit! I’d also say it’s a damn good thing no one is asking you to go to their homes and shake their hands for the cameras. Imagine the conflict.